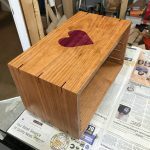 This week I finished up the mitered through dovetails on the handtool cabinet case. 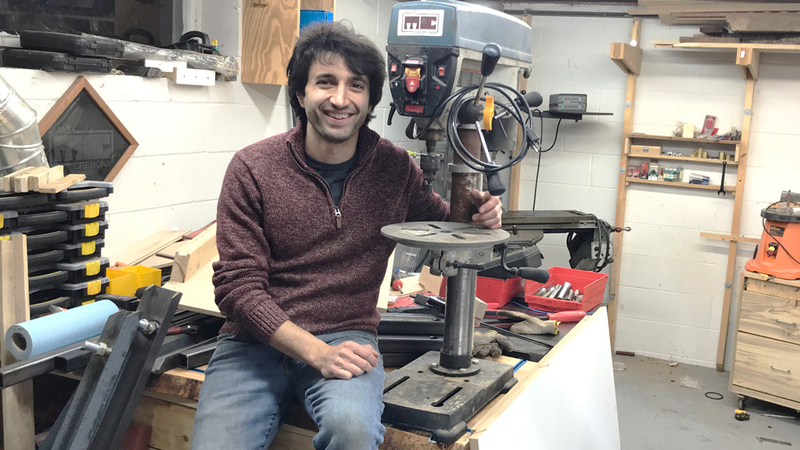 What the heck is a Vertical Milling Machine? 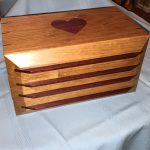 I made this jewelry box for my granddaughter Hannah. 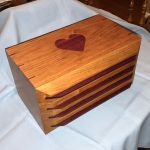 It’s made from cherry and purpleheart, finished with clear shellac and clear lacquer. Since I have a job that keeps me out of my shop for weeks at a time, this took me over 18 months to complete. 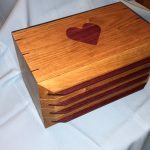 It is inspired by an award-winning project by Michael Sage, featured in the October 1996 issue of American Woodworker. Yes, I still have the hard copy. 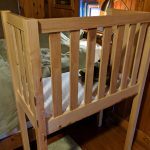 I made this sidecar sleeper crib for my new son just before he was born. 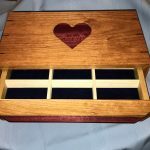 It’s made from sugar maple I milled supplemented with some kiln dried store bought maple. 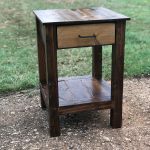 This was my first piece of furniture. 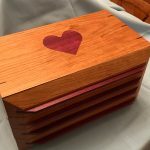 It’s made with many mortise and Tenon joints. 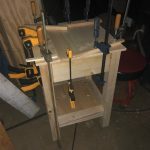 I did not have a jointer or planer at the time (I do now) so it was all hand planed to s4s, well as close as I could get it. 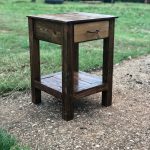 I built this nightstand for my new house. It’s made out of dimensional pine lumber. I used minwax Early American 320 stain and polyurethane. 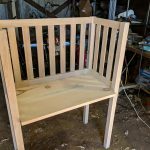 I used pocket holes and wood glue for most of the construction. A bookwheel is a rotating bookcase, ours has 8 shelves and holds 8 books (books not pictured). A user would be seated and have access to all 8 books merely by rotating the wheel. A drawing of this style of bookwheel was originally published in the 16th century. It uses planetary gearing to keep the shelves at a constant angle as the wheel is rotated. The moving parts of the our reproduction bookwheel are European Beech, and the supporting frame is White Oak. Some aspects of our design are accurate to the 16th century time-period, but of course some modern technologies were used. All components are wood except the plate steel washers and knockdown fasteners for the top and bottom cross braces. You can imagine the difficulty of ensuring axle and gear motion with humidity changes. A 4 man senior design team at the Rochester Institute of Technology (in Rochester, NY) designed and built two of these bookwheels for two university library sponsors. I would like to know more about the VFD you like using. How is it working on the new Bridgeport? I am in the process of buying one for my shop. If you have any links in your site or elsewhere on the web that could help me with wiring a VFD to b Bridgeport I would be grateful. Any Insight you could share would be helpful also. Thanks from another guy in MN. Your videos are a great pastime between snowstorms lately. This is the one that I’m using: https://www.precision-elec.com/shop/wj200-015sf/ Works as expected lol. Wiring is easy. Power in and power out just get connected to their respective terminals. (I showed that in the video where I got the Bridgeport. If you want to use an external switch (like the one mounted on the bridgeport) you just need 3 wire signal cable. Those are connected to the fwd,rev,common terminals on the vfd. Common goes to the middle connector of the switch and fwd/rev to the top and bottom. Hi Matt, thanks for sharing this blog post. 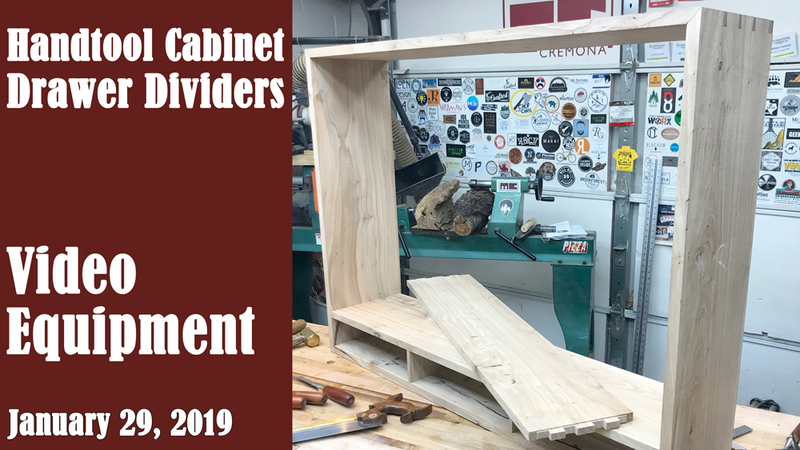 I found your step by step video on the hand-tool cabinet case very entertaining and would be simple enough to follow in my future DYI ventures!